IVC Career Services Center is dedicated to education and the empowerment of students in the career development process and a transition to professional life; developing and maintaining partnerships with employers and serving as a resource to staff and faculty. Our Vision is to empower IVC students to discover and pursue a path to a fulfilling career. 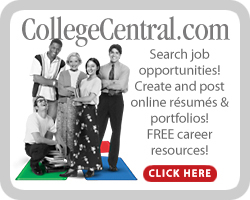 Imperial Valley College uses College Central Network as its official job resource and resume system. The site is available 24/7 to students, alumni, and employers. Students and Alumni, quickly apply to jobs and Internship opportunities posted exclusively for you, and search other opportunities via Jobs Central® and Intern Central®, national job boards.